Our Beach huts are available all year round for daily, weekly, or whole season hire. They are a popular feature and enable you to have comfort whilst gazing out to sea. Hire a beach hut and your trips to the beach are made easier without having to take all your swimwear, towels, and children's toys down to the beach every day! 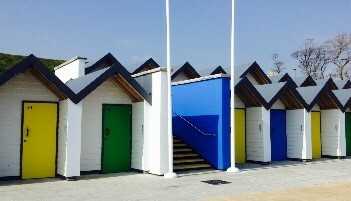 We have 60 beach huts available throughout the year, opposite the beach. Between 1st May and 30th September Shore Road is closed, providing a large safe 'promenade' which attracts many beach users and activities. This is the place to be if you have children, or you like to be part of a busy beach environment. These are also the nearest beach huts to the town, only 100 metres away. All beach huts have chairs, a table and electricity supply. Please note that all huts are fully accessible, except numbers 1 to 14 which are only accessible by steps. If you are looking for somewhere away from the crowds, then the 'Spa Beach Huts' are ideally placed. These are positioned above Shore Road, overlooking the bay. They all have a table, four chairs and electricity. The views from these are stunning! Please note that hut numbers 1 to 18 are now closed for refurbishment, which is likely to take up to four years, please see here for more information. Beach huts 27 to 35 remain open for 2019, but have very limited availability remaining. If you like a little bit of comfort away from the crowds, and stunning views, then the Spa Retreats are for you. These high specification beach huts include double-glazed doors, insulated walls, and a removable table, cushion storage bench, four chairs and comfortable cushions. A real home from home. Please note that the Spa Retreats are accessible via six steps. The Spa Retreats remain open for 2019, however, they are very popular so availability is limited.